Maurizio Sarri’s regime is well underway at Chelsea, and the changes he’s making are filtering out. One thing he’s changed from under Antonio Conte is the strict dietary rules his predecessor had in place. Spanish paper Marca have all the news, and claim that it’s down to Sarri wanting a more “relaxed” dressing room. Clearly things in there got pretty tetchy there towards the end of Conte’s reign, and we’ve already heard from Willian and others about various fallings out. Now Sarri has brought a fun new style of football, and with it some relaxed restrictions on what the players can eat, and where they spend the night before games. 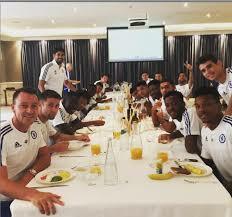 Under Conte they had to spend the night in a hotel in central London before home games – now they can spend it at home and meet up on the morning of a game. We’re not sure we like the idea of footballers being given license to do more of what they like, but if it helps the atmosphere in the dressing room, it can only be a good thing.